We are a professional long established recording studio Perth based but also servicing clients all around Australia. 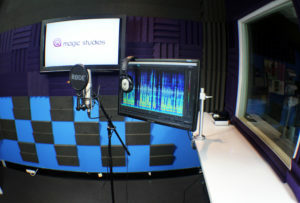 Magic Studios have facilities consisting of two vocal recording booths and three audio editing rooms. 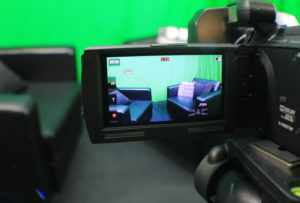 We even have a chromakey video studio and a video editing room. They feature industry-standard Pro Tools software, Apogee, MOTU & Digi design hardware interfaces, Rode, Shure & AKG microphones. 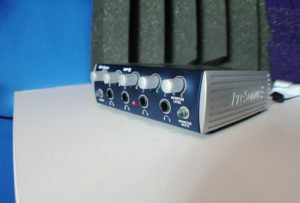 We also use a host of top quality audio plugins for professional sound processing and manipulation. Can I hire the recording studios? 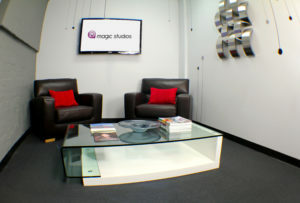 Yes, you can hire our recording studios at very competitive rates. The studios come equipped with highly qualified and experienced sound engineers that work with you to get the best voice over recordings and audio productions possible. We work closely with training organisations like the SAE Institute to make sure we have staff with the latest skill sets. We can also fully manage your voice over audio project. From scripting, voice over talent casting, to final recording and mastering. How we deliver audio productions fast! Audio productions are supplied in many common formats including CD-Audio, WAV, MP3, OGG, FLAC and AIFF. We also have 1000’s of custom sound effects to suit any audio production. 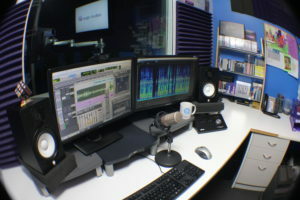 Our voice over studios deliver audio to clients in all types of industries all over Australia. We can either email smaller files, deliver via FTP, or use file sharing services like Drop box and Hightail. If you have a massive audio project larger portable storage devices can be used. We then securely express post or courier the hardware to your location.